Well, Arsenal didn't lose on Sunday, but they do still have only one win from their last six in the league, so extrapolating that over their remaining 10 fixtures, they're going to finish... ummmm... carry the one... divide by pi... 53rd? There are only three clubs in the Premier League with fewer than Arsenal's one win in their last five fixtures. Two of them are in 19th and 20th place, Middlesbrough and Sunderland, respectively. The other is West Ham, Arsenal's opponent tonight at the Emirates. Arsenal badly need a win. But you knew that already. There's nothing more to say than that. So, now we're running out of players again. On top of Petr Čech's ongoing calf problem, word came out yesterday that David Ospina has been ruled out with a knock of his own. That means Damián Emiliano "Emi" "The Argentine Assassin" Martínez will be called into action and a hastily constructed brick wall will serve as his back-up. The news on Laurent Koscielny sounds pretty bleak, too, which is far from ideal given Arsenal's current table-related circumstances. It's an Achilles problem, the severity of which depends on whether it's inflammation or a rupture. If it's the former, he could be back for Crystal Palace on Monday. If it's the latter, it'll be several weeks. There are still doubts over the midfielders who missed out on Sunday, as Aaron Ramsey has a calf problem and Alex Oxlade-Chamberlain has a hamstring problem. But what else is new? As such, aside from Ospina and Koscielny coming out, I wouldn't expect any changes to the XI. Predicted XI: Martínez, Bellerín, Mustafi, Gabriel, Monreal, Xhaka, Coquelin, Walcott, Alexis, Özil, Welbeck. West Ham are without Pedro Obiang for the rest of the season after ankle surgery and will be without Angelo Ogbonna for at least three more weeks as well with a knee injury. Winston Reid is out until the end of the month with a groin injury. Diafra Sakho is 50/50 for this one with a back injury, while Michail Antonio could be available as he returns from a hamstring injury; Antonio has not played since March 18 against Leicester and had to pull out of the England squad during the last international break. I've seen Aaron Cresswell listed as both "out" and "doubtful" with a knock, so I'll keep him in the doubt column here. Predicted XI: Randolph, Byram, Collins, Fonte, Masuaku, Noble, Kouyaté, Antonio, Snodgrass, Lanzini, Carroll. It's now one win from six for Arsenal in the Premier League, now that a five match unbeaten run from December 26 through January 22 has completely fallen out of the form chart. On the other hand, it's now zero wins from six for West Ham, who have not won since February 4 at Southampton. So, let's examine both sides' current precariousness, shall we? Arsenal are in sixth, but have a game in hand on many of the clubs around them (and two on Liverpool.) They are 18 points out of first, 11 points beyond Tottenham for second, eight back of Liverpool for third, seven points back of Manchester City for fourth, and three points back of Manchester United for fifth. Again, with at least one game in hand on all of the teams they are chasing, finishing in the top four is not impossible. Catching Spurs, however, would require... well, Spurs would have to do what they did last year again. West Ham are in 15th, with 33 points. They are six points clear of Hull City for relegation, but the Hammers are definitely trending in the wrong direction (a bit like us!) Last weekend, they blew a 1-0 lead and lost to Hull 2-1 on Humberside. While it seems close to certain that Middlesbrough and Sunderland will go down this year, West Ham are falling in to the conversation along with the likes of Swansea and Hull to join them in the Championship; Crystal Palace are down there as well, but have won four straight. Still, if West Ham win this game by four, they can climb to 10th, so who knows? Back in December, Arsenal made their first trip to the Olympic Stadium and defeated West Ham by a 5-1 scoreline. Mesut Özil gave Arsenal a 1-0 lead on 24 minutes. Alexis Sánchez doubled the lead on 72 minutes, then picked up a brace on 80. Andy Carroll pulled a goal back three minutes later, but Alex Oxlade-Chamberlain made it 4-1 in reply immediately and Alexis netted his hat trick two minutes after that to complete the scoring. At the time, the win brought Arsenal into second place, three points back of Chelsea. Halcyon days, indeed. Arsenal took only one of a possible six points from West Ham last season. On the opening day of the season, West Ham flew out of the gates with an emphatic 2-0 win at the Emirates. Cheikhou Kouyaté scored from a set piece just before halftime, which had been misjudged by Petr Čech, to give the Hammers the lead and Mauro Zárate, now at Watford, added a second from a defensive error on 57 minutes. Arsenal had 62% of the possession and took 22 shots, but failed to hit the net. Later in the year, Arsenal blew a 2-0 lead, then had to come from behind to draw 3-3. 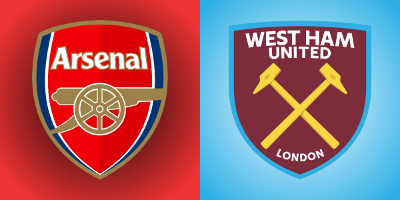 Prior to last year, Arsenal had had a 10-match winning streak against West Ham, dating back to a 2-2 draw in October of 2009, and had been unbeaten in 15, dating back to 2007. The referee is West Yorkshire-based Martin Atkinson. This does not exactly bode well for Arsenal; Atkinson took charge of West Ham's win at the Emirates last season. Since then, Arsenal haven't had a great record with Atkinson either. They've won twice: 2-1 over Leicester last season, in which a soft red card made up for a bad penalty earlier, and 4-1 over Sunderland earlier this year, in which Arsenal stormed back after a penalty made it 1-1. Earlier this season, Arsenal also lost 2-1 to Manchester City and 3-1 to Chelsea with Atkinson in the middle, so you'll recall he was the one who allowed to Chelsea to score by elbowing Hector Bellerín in the head. For West Ham this season, Atkinson has taken charge of a 4-2 loss to Watford, a 1-0 win over Crystal Palace, and a 3-1 win over Middlesbrough. John Painting is a contributing writer to the Modern Gooner and not at all a robot seeking to destroy humanity. You can follow him on Twitter @zorrocat for 11011011, I mean jokes, funny jokes, hahaha110101ha.